NAS Dock v1.2 for Nano Pi NEO / NEO 2 is, as the name implies, a complete mini NAS kit for 2.5″ drive for NanoPi NEO or NEO 2 board. The NEO 2 board is strongly recommended, since it’s not much more expensive, but should deliver much better results due to its Gigabit Ethernet interface. I’ve received two of those kits together with several other boards & accessories from FriendlyELEC, and today I’ll show how to assemble the kit, configure OpenMediaVault, and run some benchmarks. 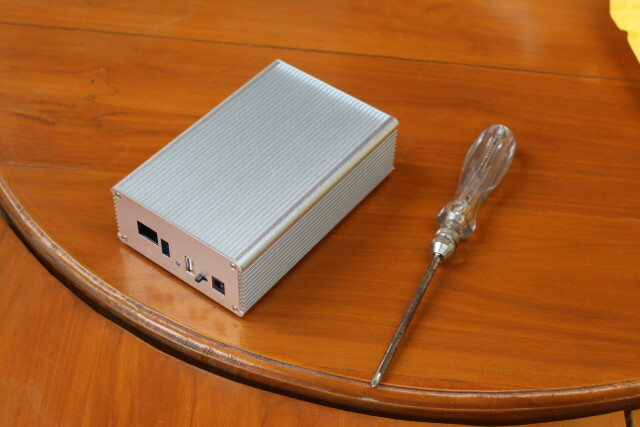 The only extra tool you’ll need is a screwdriver, and potentially a soldering iron as we’ll see further below. The metal box is stuff wih accessories so the first thing is to open one or two sides to take out the content. 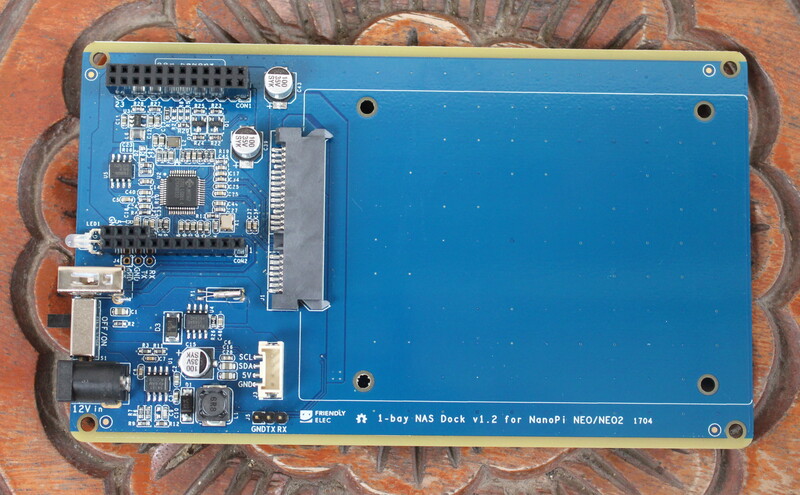 We have the mainboard, NanoPi NEO back plate, NanoPi NEO 2 back plater, a heatsink and thermal set, and a set of 5 screws to tighten the hard drive which mean there’s one extra screw. FriendlyELEC always adds extra screws, and I find it’s a nice touch, as it can be a real pain if you happen to lose one. Let’s have a closer look at the “1-bay NAS Dock v1.2 for NanoPi NEO/NEO2” board. 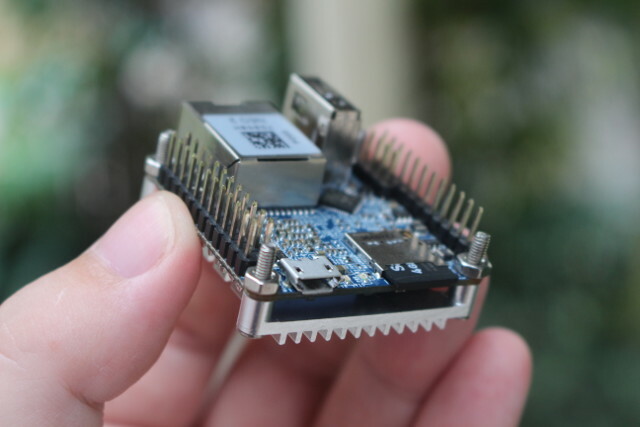 We have a UAS capable USB 3.0 to SATA brige chip between the two header for NanoPi NEO board (note that the USB connection will be limited to USB 2.0 since the board only supports that), an LED, a USB 2.0 host port for a printer, WiFi dongle, or webcam, the power switch, the power jack, a 3-pin serial header, an I2C connector for Grove modules, and of course the SATA connector. 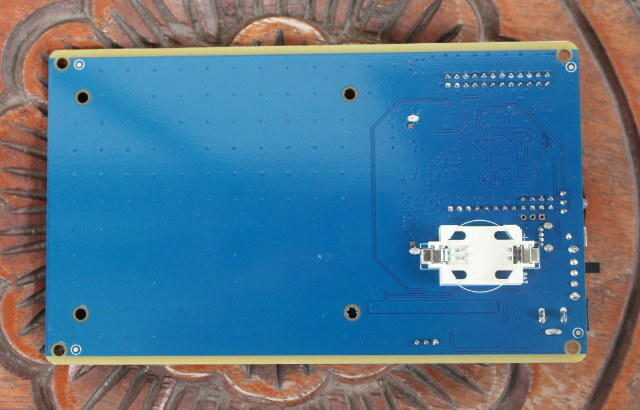 There’s not much on the other side of the board, except a CR2032 battery slot for the RTC. 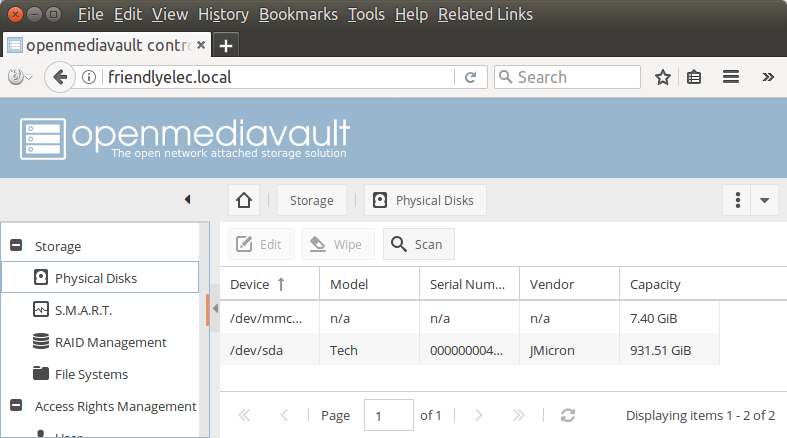 Before going further, you’ll need to go to the Wiki, and get the latest OpenMediaVault firmware, in my case nanopi-neo2_debian-nas-jessie_4.11.2_20170531.img.zip, which I then flashed with Ether program to a micro SD card..
Once this is done, install the heatsink and thermal to your NanoPi NEO 2 board, and insert the micro SD card into the board. Notice that I also soldered the headers. While it would be obvious to people would have looked at the pinout diagram, I’ve read some people have justed connect the board using the (pre-soldered) 4-pin header, as they may have believed it was a USB header, but it’s just the serial console instead, and obviously the hard drive was not detected. If you don’t feel like soldering the headers to the board yourself, make sure you tick the option “with pin headers soldered” when ordering. It just costs $1 extra. Now we can insert our board into the “1-bay NAS Dock” board, instead the hard drive, and optionally an I2C module. 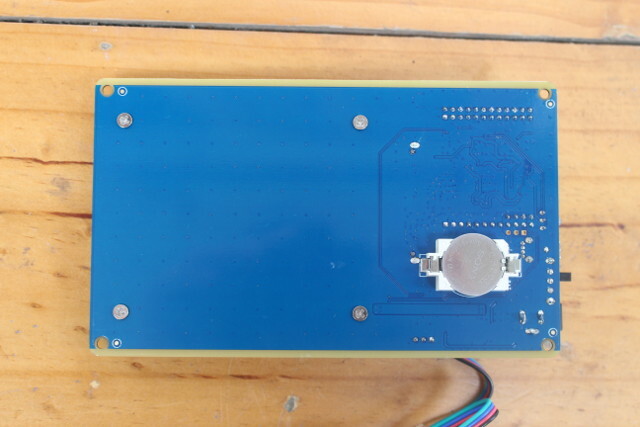 I connected an I2C OLED display i the picture below for illustrate, as using the display would require cutting out the case. Some people may want to connect an I2C temperature sensor instead. I used four screws to tighen the hard drive on the other side of the board, and install a CR2032 battery for the real-time clock. Finally, you’ll need a 12V power supply with at least 1A, but I could not find any (safe) spare ones so I used Maxoak K2 power bank instead, since it can output 12V @ 2.5 A max. The boot was just stuck there. I re-inserted the micro SD in my PC, and I could see both boot and rootfs partitions, so everything looked good. Then I went back to the 12V power input on NAS Kit with the power bank and the boot succeeded. Very strange. It turns out the board would not boot most of the time, but the symptoms are not reproducible 100% of the time. This kind of random behavior is usually a timing or distorted signal issue. So I thought the micro SD card might not play well with the board, and the power bank signal might not be so clean. So I first flashed another micro SD card, but same results. I used another 12V/5A power supply, and it did not really help either. Finally, I used another NanoPi NEO 2 board and it appears to be stable. PING FriendlyELEC.local (192.168.0.110) 56(84) bytes of data. Alternatively, you could check out the IP address in other ways. In my case, I just type friendlyelec.local in Firefox to access the web interface. 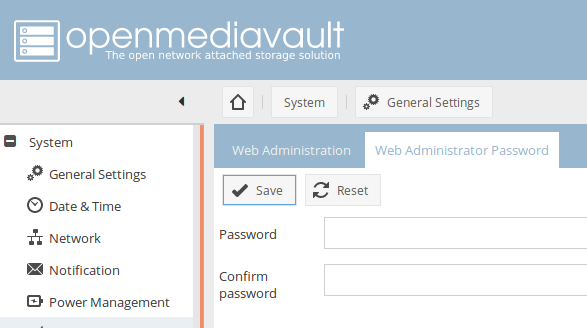 The default username and password are admin and openmediavault. After login, you can access the dashboard showing system information, and which services are running. You may want to disable the services you don’t need. You can go to Storage->Physical Disks to check if your hard drive has been detected. No problem for me here with a 931.51 GiB drive detected. You may then want to setup a fix IP address. 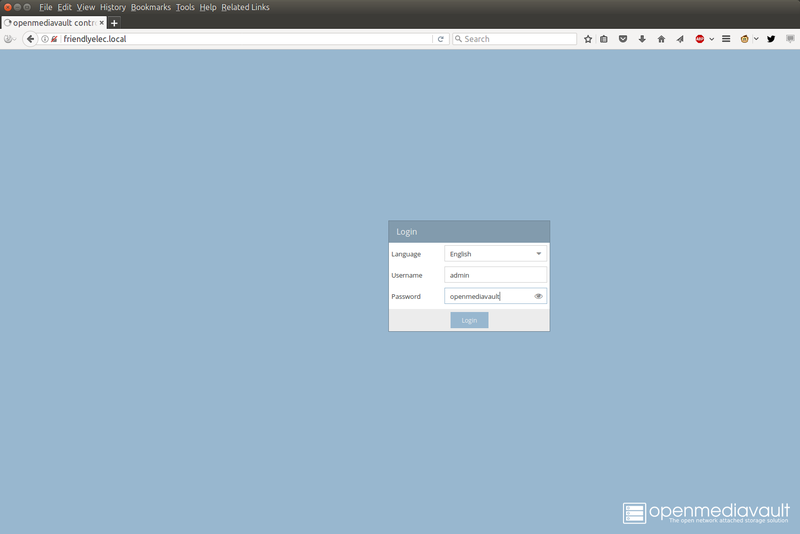 There are various ways to do this but I went to Network->Interfaces and set eth0 to a fixed IP address. You’ll be asked to apply the changes once it’s done. 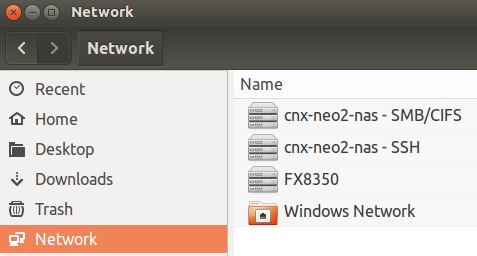 I also changed the hostname to CNX-NEO2-NAS in the General tab. After that I decided to address some security issues. First by changing the administrator password in General Settings->Web Administrator Password. 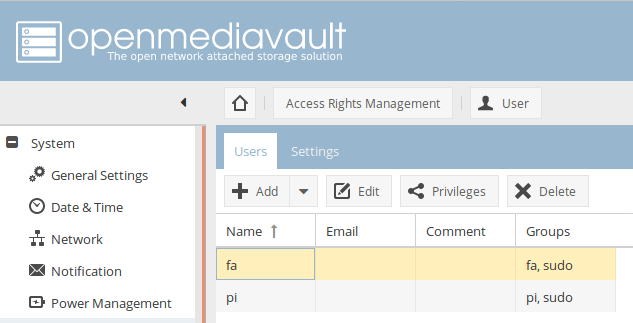 I then went to Access Rights Management->User to find out there were two pre-configured users: pi and fa. I deleted fa user, changed pi’s user password, and added it to ssh group. It’s actually even probably better to just delete both user, and create your own. The root user is not shown, but you’ll want to login as root through ssh first and change the password, as the default password is fa. Once it’s done, you’ll have better security, and your system should not be easily accessible via basic “hacks”. For more security, you’ll still want to install an RSA certificate. A self-signed one should do if you plan to use it only in the local network, but you may also consider a free Let’s Encrypt certificate instead. We can now take care of the hard drive. I went to Storage->File Systems, and clicked on +Create file system which will let you choose between BTRFS, EXT3, EXT4, XFS, and JFS. I’ve gone with EXT4 first. After a few minutes you drive should be formatted, so we can configure network shares. 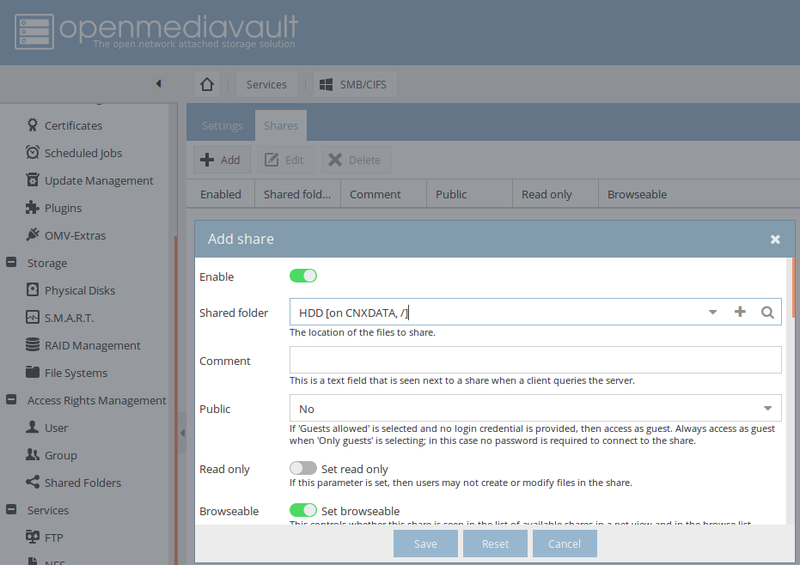 I want to use SAMBA and SFTP to transfer files for the purpose of this review, so I went to Access Rights Management->Shared Folders to add a new share called HDD for the root of of hard drive. You may want to add multiple share if you plan to split videos, documents, music and so on. 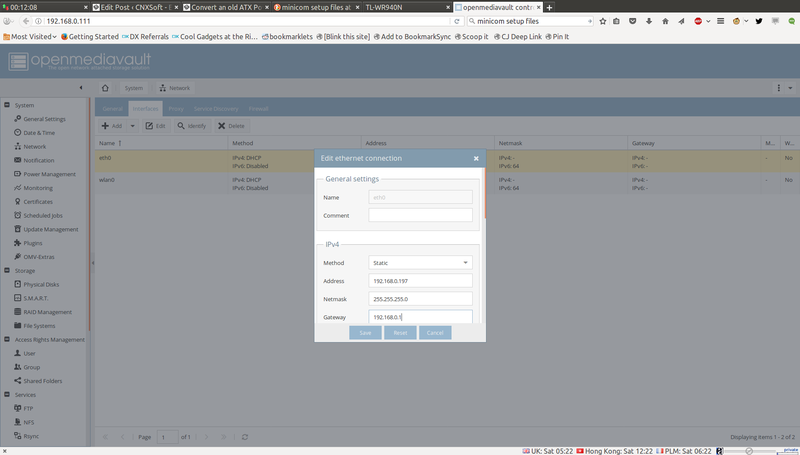 I clicked Save, and selected ACL to add permissions to pi and admin users. You can add whatever users you plan to use to access the share. That share3d folder can now be assigned to the services you plan to use. SFTP is enabled by default when SSH is running, so I create a SAMA/CIFS share by going to Services->SMB/CIFS->Shares to add the share. Browsing the Network with Nautilus would show both cnx-neo2-NAS – SMB.CIFS and cnx-neo2-nas – SSH (SFTP) shares. Configuration is now complete. I have not find a clean way to power off the system, so I normally open a terminal session via ssh and run the shutdown now command. A software button to turn of the NAS would have been a nice features on the kit. I also often encountered the error “Software Failure. Press left mouse button to continue. Session not authenticated.” before the session timeout is set to 5 minutes. If you prefer a longer timeout, you can change it in General Settings->Web Administration. Perfect! You’d just have to make sure the “set” command is run automatically at boot time if the time in the RTC is set. It would be good if FriendlyELEC updated their image to do that automatically at boot time. The end result is a directory with 64,013 files totaling 748.6 MB. root@cnx-neo2-nas:/srv/dev-disk-by-label-CNXDATA# iozone -e -I -a -s 100M -r 4k -r 16k -r 512k -r 1024k -r 16384k -i 0 -i 1 -i 2 Iozone: Performance Test of File I/O Version $Revision: 3.429 $ Compiled for 64 bit mode. Build: linux Run began: Sat Jun 17 07:46:20 2017 Include fsync in write timing O_DIRECT feature enabled Auto Mode File size set to 102400 kB Record Size 4 kB Record Size 16 kB Record Size 512 kB Record Size 1024 kB Record Size 16384 kB Command line used: iozone -e -I -a -s 100M -r 4k -r 16k -r 512k -r 10242 Output is in kBytes/sec Time Resolution = 0.000001 seconds. Processor cache size set to 1024 kBytes. Processor cache line size set to 32 bytes. File stride size set to 17 * record size. random random bkwd record stride kB reclen write rewrite read reread read write read rewrite read fwrite frewrite fread freread 102400 4 8668 8947 8978 9164 486 732 102400 16 20660 21090 20761 21579 1891 3512 102400 512 24643 25185 38237 40271 24545 26282 102400 1024 25676 26720 38948 40451 30554 26253 102400 16384 25365 26658 39299 41369 40647 26235 iozone test complete. random random bkwd record stride kB reclen write rewrite read reread read write read rewrite read fwrite frewrite fread freread 102400 4 8225 7763 8776 7939 491 7971 102400 16 19279 18923 20854 21008 1874 17037 102400 512 35049 34780 37170 36023 23173 33961 102400 1024 35323 35730 37113 37428 28020 34652 102400 16384 37381 37348 40899 41318 40575 37479 iozone test complete. random random bkwd record stride kB reclen write rewrite read reread read write read rewrite read fwrite frewrite fread freread 102400 4 7896 8199 9681 9392 510 756 102400 16 20343 21484 20715 21173 1983 4372 102400 512 23512 24129 39104 40450 25062 25884 102400 1024 31040 33526 39122 40805 31155 34293 102400 16384 34323 35551 39752 41428 40645 34403 iozone test complete. I’ve taken results with 16384kB reclen for read, write, random read and random write values to draw a chart, since most people are likely going to store large files in their NAS. The smaller reclen could be interesting if you plan to handle smaller files. 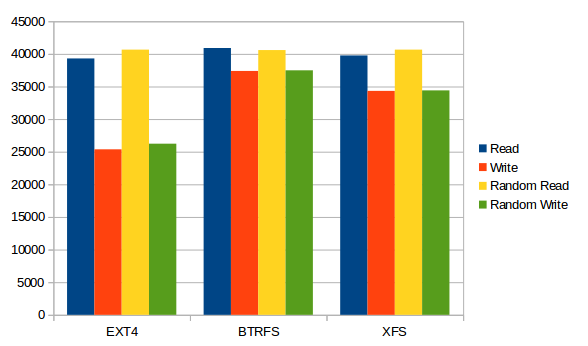 All three file systems have a very good read speed of around 40 MB/s, but BTRFS write appear to be the fastest among the three, with EXT-4 being the weakest at around 25 MB/s. But for some reasons, those results are useless in practice, as we’ll see below. Finding out the exact reason would possibly require studying and profiling iozone and the kernel source code which would be outside of the scope of this review. Results for large files in minutes and seconds. First, we can see very good read performance from the NAS (NAS to my PC) with 41 to 42 MB/s close to the theorethical limit of a USB 2.0 connection. 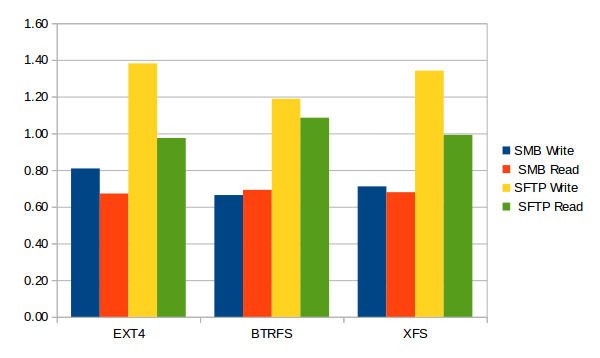 Write speed is a a little different as the files were transferred more slowly with BTRS, and around 40MB/s with EXT-4 and XFS. Since SFTP is encrypted the transfer speed is roughly the same for all three file systems. 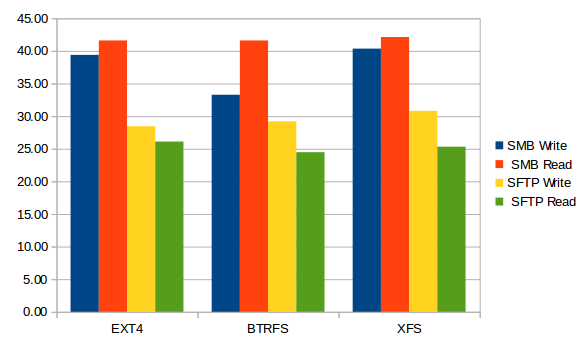 Overall the file system you choose does not really impact performance with large files. Results for small files in minutes and seconds. time tar zcf - Network_Test_Files_Small | ssh pi@cnx-neo2-nas.local "cd /srv/dev-disk-by-label-CNXDATA; tar xzf -"
It took just 1 minute and 49 seconds to transfer all 64,013 files, or over five times faster than SFTP write to XFS, at around an effective 6.86 MB/s. So knowing your tools may matter as much as having the right hardware. I was going to run a last part after enabling optimizations provided by tkaiser, but it turns out FriendELEC has already done that in their firmware image. If you want to reproduce the setup above, you’ll need to purchase NAS Kit v1.2 for $12.99, and a NanoPi NEO 2 with soldered headers for $15.99. If you don’t have a 2.5″ hard drive, you’ll need to add this, as well as a 12V power supply which you could purchase locally, or on FriendlyELEC website for under $10. All in all that’s cheaper than a similar kit with a Raspberry Pi 3 board, and you’ll get close to four times the SAMBA performance for large files since RPi 3 will be limited to 10 to 12 MB/s due to the Fast Ethernet connection. Mine will arrive in 2 weeks. Can’t wait! 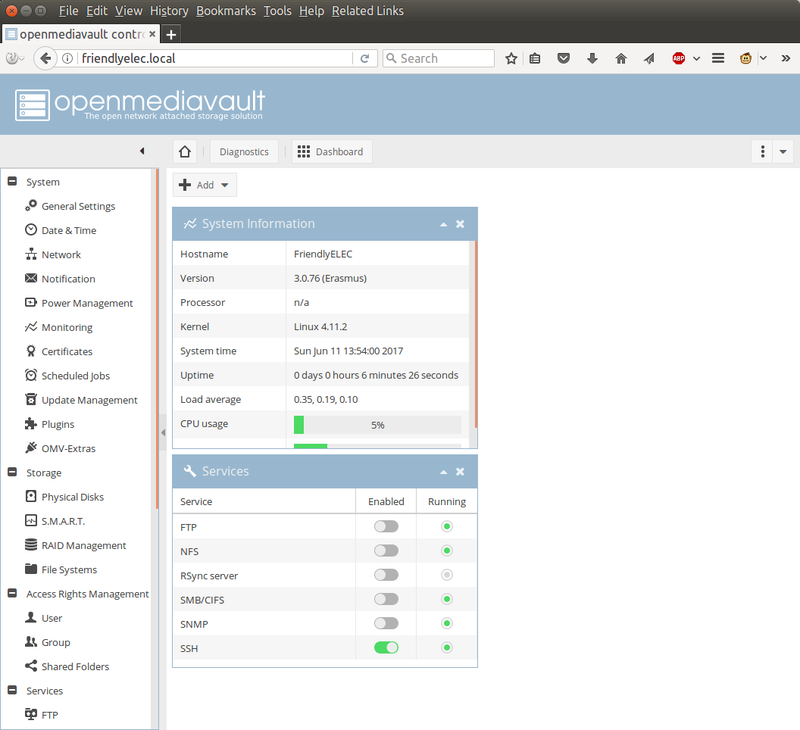 Thanks for the numbers and taking care of details (like improved Samba settings in FriendlyELEC’s OMV image). I reformatted the drive for each test, so the full 1TB (931MB) was used for each partitions. Good to know, in the meantime I checked FriendlyELEC’s kernel repo (github.com/friendlyarm/linux/tree/sunxi-4.11.y) and saw they’re using ondemand as default which might be another possible explanation for some weird looking numbers. Unfortunately their english wiki page is still not updated. @cnxsoft: Are you able to do a quick test with a 3.5″ HDD? In that case a 12V/2.5A PSU would be a good idea. Sorry I can’t try. This would require a SATA male to female cable. I only have female to female cables. Maybe if enough people make the case for it and uses they might? For which use case do you need more DRAM? I was talking about using the PCB to directly connect to a 3.5″ HDD without a cable in between. 70$ shipping to Belgium. It’s twice the price of the kit! Oh OK. I thought the SATA connector was higher on 3.5″ drives… But it fits perfectly. I’m using a 12V/5A power supply. FriendlyELEC should make another case for a 3.5″ drive. That would allow for more capacity. Yeah, there is no different SATA connector for 2.5″ or 3.5″, the only question is always whether 12V is available on power pins or not. 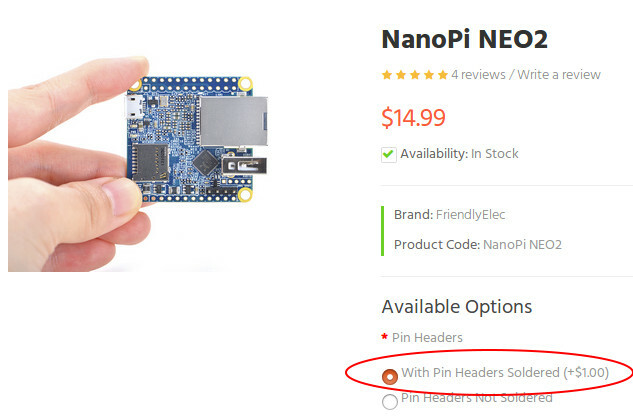 Thank you for confirming, I hope FriendlyELEC starts to sell the NAS 1.2 PCB separately too. That’s weird they only sell v1.0 board separately. I thought they would have just phased out that board. What is the maximum hard drive size it supports? I already noticed it was the old version on the aliexpress store. BTW it’s also only the kit without the nanopi-neo. I don’t think some vendor will be interested in Belgium. They are alienated here for such things. In the Netherlands they are more open to it. With the above 1.2 version of the kit there’s no limitation. 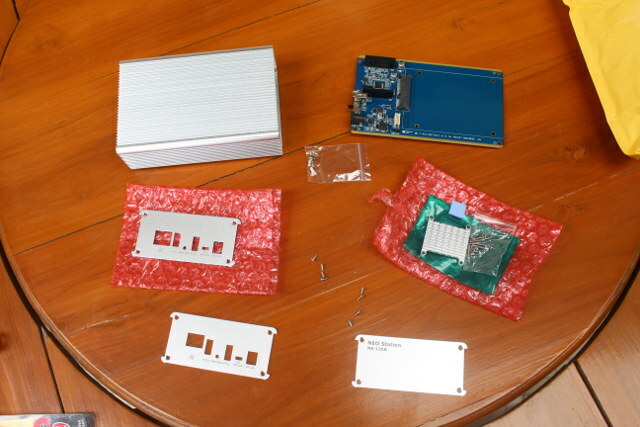 JMS567 supports SATA drives of any size. Be careful when following obscure links to the old 1.0 variant of this kit or at least do some research on your own whether JM20329 used there is capable to deal with disks that exceed 2.2TB in size (32 bit integer overflow with old USB-to-SATA bridges) and can cope with Advanced format 4K drives. do you guys know what’s the HDD operating temperature inside the case ? according to this study (fig 5), failure rates of 3+ year old drives tend to skyrocket when avg operating temp exceeds 40°C. This is a Notebook HDD currently used in an external enclosure to do backups, all thermal data fine. Wrt to the Google study it’s always amazing what people extract from data. The study shows clearly the opposite of what you claimed 😉 ‘The figure shows that failures do not increase when the average temperature increases. In fact, there is a clear trend showing that lower temperatures are associated with higher failure rates’. Also ‘One of our key findings has been the lack of a consistent pattern of higher failure rates for higher temperature drives or for those drives at higher utilization levels’. That’s the data. Only for some 3 or 4 year old drives there was a somewhat different correlation (correlation != causation). This study is from 2006 and tells clearly: ‘The data used for this study were collected between December 2005 and August 2006’ so some statistical correlation for some disks that were put into production in 2001/2002 should matter for any decision today? Really? come on tkaiser… imho the text you quoted is more of a general interpretation. The data is shown by the graphs, not the text. And my “claim” (i don’t like this term, it’s more like how i interpret the graphs) took into account temperature AND disk age. Figure 2 clearly shows that AFR (average annualized disk failure) is much higher starting with 2+ years old drives. Is my reading of this graph wrong ? i don’t think so. Figure 5 adds in ‘average drive temperature’. And yes, AFR of 3 years old drives skyrockets when their temp >= 40°C. Is my reading of this graph wrong ? once again, i don’t think so. should i make as if this study didn’t exist ? really ? This device support more them 1tb disk?! Results of the command after copying a large (~100GB) file over SAMBA. CPU is around 75% idle during the copy so it’s not a worst case scenario. Room temperature is around 30 C.
Looking forward to just get the PCB, a 3.5″ HDD and then combine it with NEO2 or even NEO Plus 2. The photoshop looks about right (dimensions wise). it looks like the backblaze article mentions HDD which average temperature <= 38°C. obviously i wasn't talking about this scenario : google graphs show AFR = 40°C. but at least there the text (interpretation) doesn’t seem to contradict the graphs (data vizualisation). and i’m not surprised here. there’s definitely a “by drive age” bias in google study. this is shown by the 2 graphs i mentionned in a previous comment which seem to contradict their own interpretation. btw, thx for telling about the “smartctl -l scttemp” option, that’s very interesting. You should really read the studys you want to rely on. I know this paper since years and it’s IMO a good example why statistics is so hard. The folks who did the data research wanted to show a causation of higher temperatures with higher failure rates. They were so focused on temperature that they simply forgot about everything else, especially vibrations. They mention ‘vibrations’ as follows: ‘We currently do not have metrics that expose the level of induced vibration, and measuring the impact of vibration is one of our projects that are currently underway’ and then simply forget about it and focus on aging and temperature only. I would call this already stupid. If you look at the graphs at page 12 it’s obvious that position of drives/servers matters more than temperature so you have to think about what’s different wrt position and that might be that the inner drives are exposed to more vibrations as the outer drives (that show similar low failure rates but totally different averaged temperatures). While the HDD is spinning but idle HDD temp remains at 38°C and SoC is 1°C above normal level (so that’s HDD heat dissipating over to the SoC) while PMIC is 2.5°C above normal level (PMIC temperature rises with load). In other words: As expected everything’s fine. Final comment: I hope you know that you don’t need to care about statistical data for fleets of HDDs if you’ve only one or a few disks? They don’t care or know about statistics and die within a few months or survive 10 years or longer. The above numbers are only interesting if you plan to use at least hundreds (better thousands) of disks since only then you can benefit from statistical results if they show a causation and not just correlations and you never looked into whether that’s the real cause. Wrt disks and vibrations please visit youtube and search for ‘shouting in the data center’ 🙂 And another nice example why statistics is complex and correlations are no causations can be found on the web searching for ‘stork babies statistics’. Does anyone use OMV on an SD card with read-only root? If you use any of the Armbian based OMV builds from here https://sourceforge.net/projects/openmediavault/files/Other%20armhf%20images/ (or the most recent ones for ODROID-C1/C2/XU4 at the same location) you don’t need to care about that. Due to disabled monitoring and optimized settings (Armbian settings + folder2ram) SD card writes are reduced to the absolute minimum. If you don’t trust in SD cards at all you could create a small partition (4GB are already sufficient) on any of the disks and move the rootfs over using ‘nand-sata-install’. SD card has to remain in the slot but only the bootloader is read so then the SD card is really read-only. I would like to have a guarantee that the file system will not be broken if unexpected power off, so I’d like to make the root filesystem read-only. Was the bad NanoPi NEO 2 board unstable by itself if unplugged from the NAS board? Maybe the NAS board is causing the instability. What did the manufacturer have to say about this? Anyone else with out-of-the-box unstable or dead NanoPi NEO 2 hardware, with or without the NAS board? SAMBA was recently found to have some serious bugs and was patched on all mainstream distros, so I would suggest research into this plus figuring out how to patch the NAS box OS (good luck with that). I’d like to make the root filesystem read-only. Not possible and useless anyway since power losses could also corrupt data on the NAS shares. If you expect power problems simply fix them first! You can use any UPS here since power draw of such an idle NAS will be as low as 1W (a little bit more if you use an overrated 12V PSU brick). LOL! FUD galore! OMV3 is based on Debian Jessie, Samba packages are those from upstream Debian repositories so Debian’s security team will provide fixes. 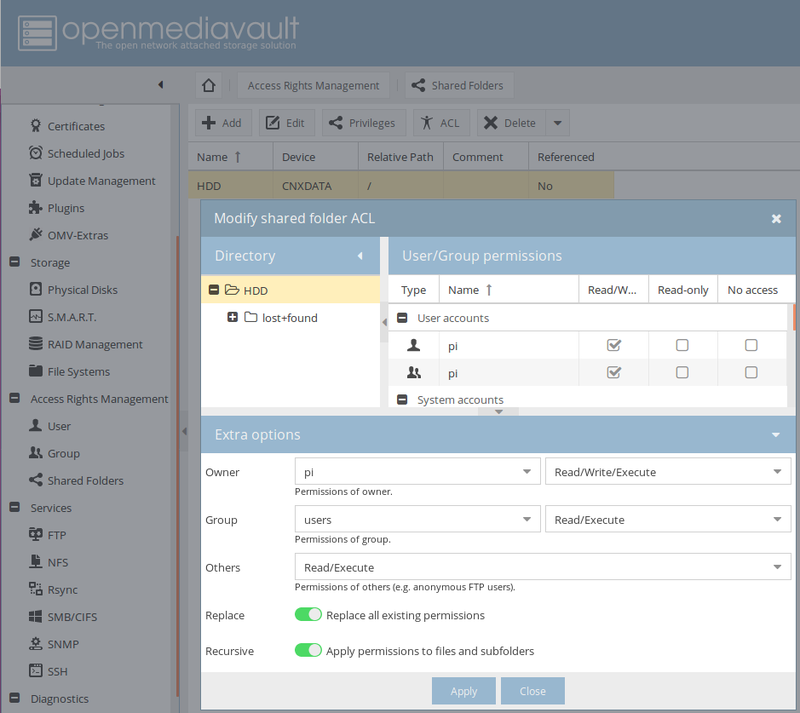 I can’t speak for FriendlyELEC’s OMV image (since never used or tested) but the Armbian based OMV variants enable ‘unattended upgrades’ so as long as you let your NAS box access the Internet you get security fixes automagically on a daily basis! For anyone concerned about Samba vulnerabilities and OMV: Simply allow unattended upgrades and update regularly! And check https://security-tracker.debian.org/tracker/source-package/samba if in doubt. You should given your experience do your own blog or a PDF book. Other people still promote Banana Pi !? That’s the reason we use Olimex Lime2 for small NAS boxes. There you simply plug in a battery and are done since Olimex engineers are not that stupid as others (talking about Bananas here) and a connected disk runs from battery if needed. Olimex Lime2 has an old A20 SoC. It would be nice if FriendlyArm engineers added the LiPo battery connector to the NAS Dock. Adding a battery connector isn’t enough, you need charging circuitry and also some logic how to switch between power sources if needed. That’s the (only) reason why tablet SoCs like A20 are nice for small NAS because they’re accompanied by PMICs (AXP209 in A20’s case) that handle this. TV box SoCs like the one we’re talking here about (H5) miss this. But just adding a battery connector and PMIC is also not sufficient as you can see by looking at the ‘designs’ from manufacturers known as ‘brain damaged retards’. On almost all Banana Pi for example you find a battery connector and a PMIC but those ‘engineers’ never think about what they’re doing and so connected disks won’t be powered when running from battery. I meant to add the connector -> to add the ability to use the battery for power backup (with switching logic). This can be achieved not only by relying on SoC, but adding logic on its own, for example, to the NAS Dock board. 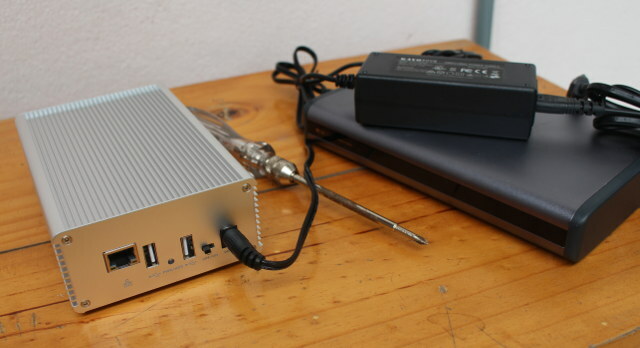 Currently the NAS kit is rather cheap ($7 without enclosure, an additional $6 for enclosure + heatsink) and if you do a web search for ’12v ups’ you find only solutions twice that expensive. By choosing a tablet SoC it’s just adding PMIC, boost converter and a common battery connecter and you’re done (regarding the latter: some manufacturers also known as brain damaged retards manage to use proprietary battery connectors you can’t find a single battery for since not even the retards sell batteries that would fit). If I would want to combine a H5 based NAS with UPS functionality I would most probably choose an Orange Pi PC2 (or Prime if my use case needs more than 1 GB DRAM) and combine it with an USB powerbank that can be charged and powers devices at the same time (only a few do!). On the Orange Pi the horizontal USB receptacles share one current limiter so USB powered disks should always be connected to the upright USB port instead. That’s one solution, but this won’t work with all power bank though, as some will take some small time to switch between mains and battery power to the board may reboot. Some power bank (like the 50A one I used in this review) may just shutdown after a power failure, and you may have to press the button manually again to turn it on. This should also be tested under load.